We all know the feeling. Your guests are scheduled to arrive in OMG 30 minutes! and you haven’t showered, your cat chewed up the welcome mat, your living room is littered with laundry and last year’s taxes. You throw everything into a closet, or even the trash — think slapdash Marie Kondo, think The Gentle Art of Swedish Death Cleaning. By removing all evidence of actual living, one creates an orderly, peaceful life. 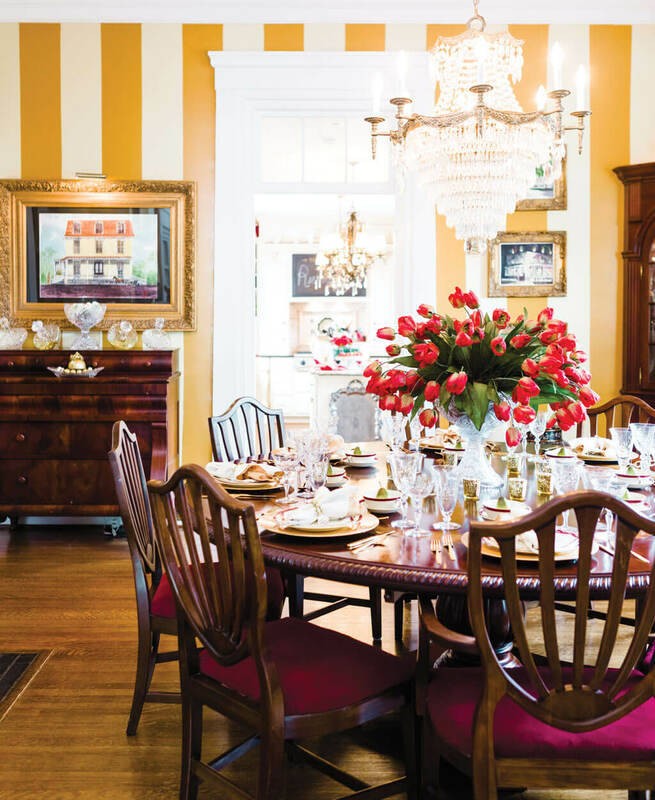 This less-is-more approach to home decor may be trending, but it’s the opposite of Tony Britt-Kirkegaard’s aesthetic, not only in his work as an interior designer, but also as a first-time host of a featured home on the Historic Wilmington Foundation’s annual home tour. 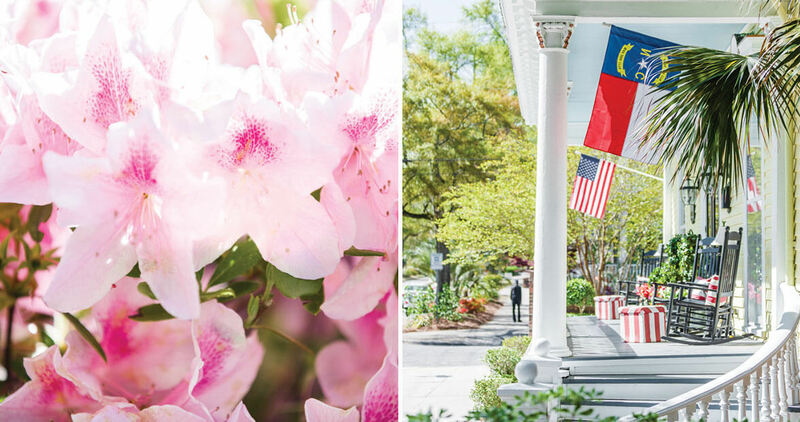 The tour of homes and the Cape Fear Garden Club’s tour of gardens are two of the more stately activities going on in Wilmington during the North Carolina Azalea Festival. 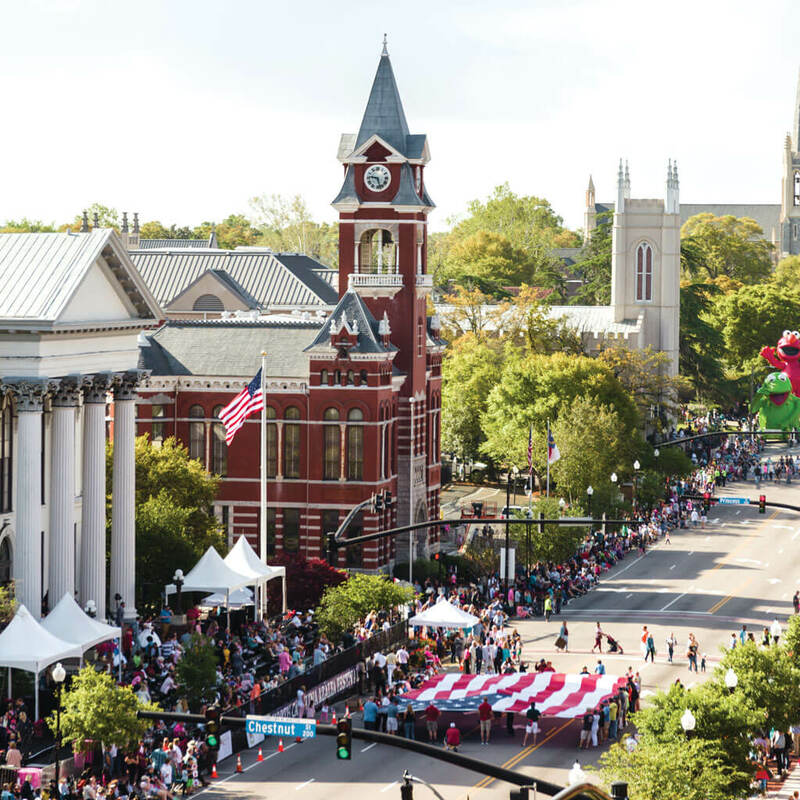 Started in 1948 to celebrate the charms and blooms of this historic city, the festival has grown into a massive weekend party — part street fair, part music festival, part parade-to-end-all-parades — that draws 300,000 visitors each April. 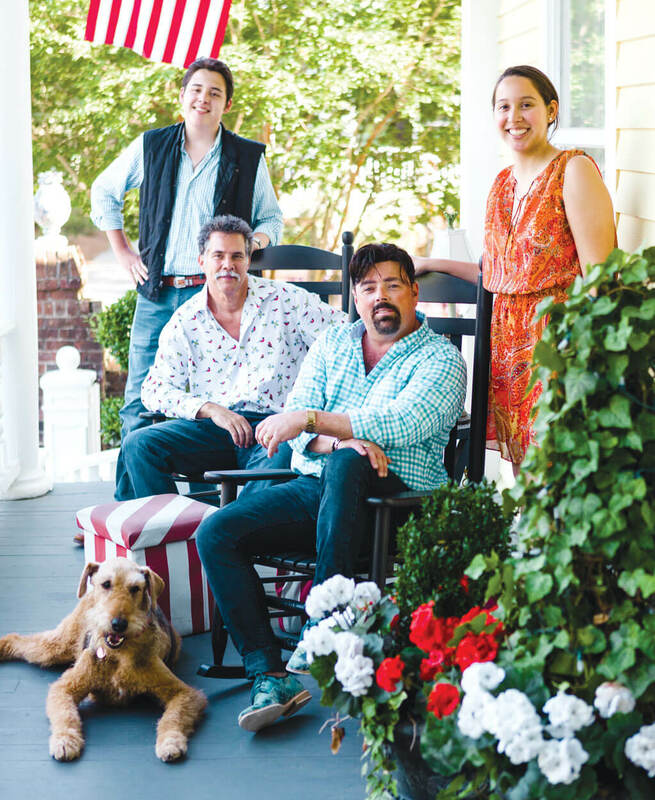 The Kirkegaard family, from left, Austin, Gary, Tony, and Brittney, have restored their 166-year-old mansion to high style. While Baron, their Airedale terrier, hides, Tony welcomes home tour guests at the front door. “I pay attention to detail,” Tony adds, a tad defensively. But a house that breaks the rules is one that everyone wants to see. While the Kirkegaard mansion — officially named the Miles Costin House — is the seventh home that Tony and Gary have shared, it is so lovingly, intuitively restored that it’s hard to believe they haven’t lived there forever. Designed and built in 1853 by James F. Post, the famed architect behind Wilmington’s Bellamy Mansion, Latimer House, Thalian Hall, and other beloved landmarks, the once-grand, Italianate-style home had been converted artlessly into apartments before falling into foreclosure. That’s when the Kirkegaards discovered it in 2014. “It hurt me to the core that the house had been chopped up this way,” says Tony, a North Carolina native. He sat alone in the vacant building many times before committing to it, listening to whatever the rooms had to tell him. It’s an approach that the French philosopher Gaston Bachelard, author of The Poetics of Space, would have liked. “If I were asked to name the chief benefit of the house,” he wrote, “I should say: the house shelters day-dreaming, the house protects the dreamer, the house allows one to dream in peace.” Inside the Miles Costin House now, one feels such silent dreams brought to life. Married for nearly 30 years, parents of 17-year-old twins Austin and Brittney, whom they adopted as infants, Gary and Tony have a formidable gift for making everybody, even crowds of strangers, feel at home. The house’s interior is characterized by a kind of joyous, carefully tended abundance, something for everyone, a profusion of beauty. There are multiples of everything: chandeliers, fireplaces, Audubon bird prints, cut-glass cake stands, 1950s motion lamps, Pfaltzgraff Heritage china, bowls and jars of candy in every room, welcoming pineapples in every medium (23 on the first floor alone, Brittney reports), humorous antique signage, giant pine cones, taxidermy (mostly from Tony’s uncle), antlers from Gary’s family in Nebraska, souvenir paddles from Gary’s childhood portaging trips in Minnesota (his father was a Scoutmaster; Gary and his two brothers were Eagle Scouts), crucifixes, pheasant feathers, quilts, creepy rabbit statuary. In all, the house bears testament to the motto on Tony’s business card: Decorating Since Birth. A few miles away from the Kirkegaards’ busy manse, in the manicured, sedate Forest Hills neighborhood, Roberta Berg-Smith does a last-minute walk-through in her backyard, cottage-style garden before the kickoff of the Cape Fear Garden Club’s Annual Garden Tour. 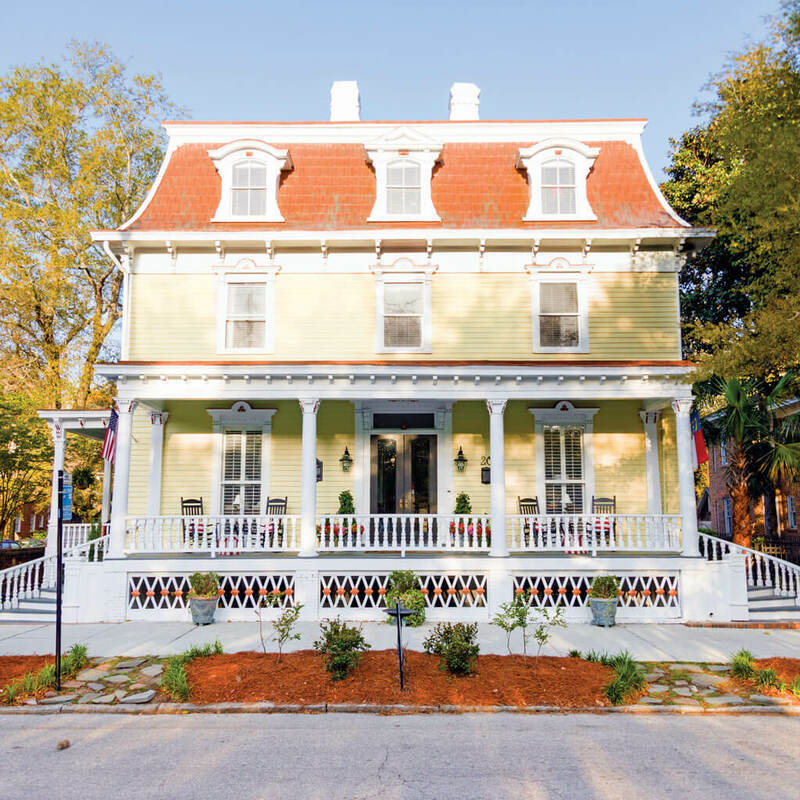 The event overlaps with the home tour and lasts three days instead of two, but it’s all part of the same festive Wilmington whirlwind that marks this particular weekend in April. Like the Kirkegaards, Roberta is a veteran tour-taker — she’s gone on both the home and garden versions each year since moving to Wilmington in 2006 — but this is her first time serving as a host. Other than some stray pots left out behind her shed, Roberta finds nothing amiss and seems unflustered by the coming stampede — more than 2,000 advance tickets have been sold. It’s hard to imagine what might unnerve Roberta. She worked in education for 36 years, including as a high school principal. Now retired, she’s fiercely active in community outreach — Suit Up Wilmington, the NAACP, and Canines for Service — and takes her own 11-year-old Labrador retriever, a certified therapy dog, to visit schools. A red, white, and blue “Hate Has No Home Here” sign remains planted on her front lawn throughout the festival. Roberta clearly possesses the bottomless well of patience required of anyone who gardens. Garden tour hosts are notified of their selection more than a year in advance of the festival, as everyone understands the inherent unpredictability of nature, the inevitable surprises, the capricious Wilmington weather. The day before the tour, her garden is invitingly, deceptively low-key — nothing showy, fussy, or ornate. There is more green than pink on display, which Roberta confirms is intentional. “You can make green stunning,” she says. The overall effect is a subtle layering of shade, texture, and hue, as artful as an Impressionist painting. A single decorative tile hangs on one stretch of wooden fence, a souvenir from a trip to India. The picnic table is made of wood reclaimed from North Carolina rivers. One week before the Azalea Festival, Tony decrees in his kitchen that there will be no more home cooking until the festival is over. “No food smells!” he declares, eliciting much eye-rolling from the twins. Despite their irreverence, Brittney and Austin are happy to help with the tour, cheerfully serving long shifts as docents. Nearly 300 new and returning volunteer docents help guide the crowds through the 10 or 11 showcased homes each year. Docents also act as unofficial security guards. Perhaps because of this, bad behavior is rare. Tony once caught a man trying to take a bite out of a fake pear — the worst transgression he can recall. The centerpiece arrangement of red tulips in his dining room is also artificial — from Hobby Lobby, in fact. While tour hosts are encouraged to show as much of their homes as possible, some get cold feet and close off rooms at the last minute. Pets are often banished. Even Baron the Airedale is in seclusion, despite his good manners. The Kirkegaards’ second and third floors are off-limits during this tour for practical reasons: The steep, curving staircases are tricky to navigate. And the third floor belongs entirely to Austin and Brittney, who will have certainly earned their privacy — not to mention plenty of quiet time to decompress — after welcoming countless strangers to their home as new friends. Roberta’s husband, Earl, is off somewhere playing golf the day before the garden tour opens. Roberta says he’s not really a gardener, though he was a native fisherman in the Bahamas, where they met, which suggests that his relationship with nature is as quietly authentic as her own. When they purchased the 78-year-old Copeland House in 2012, its exterior, front and back, was shrouded by hedges and shrubs. But amid the overgrowth, Roberta found azaleas and camellias, and the many tall, lovely deciduous trees that she chose to keep — thus setting a challenge for herself. 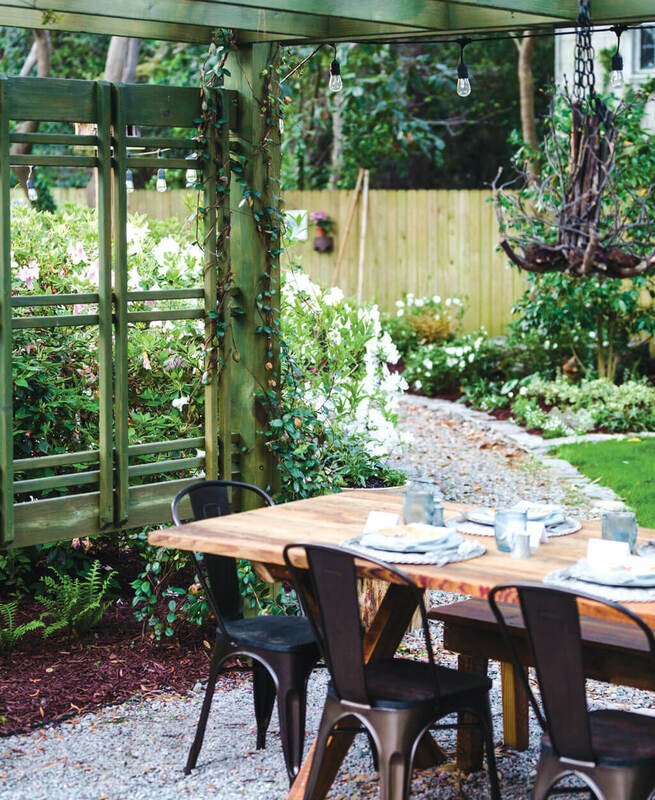 “My journey was to transform the backyard into a shade paradise,” she says. Everything she plants must be able to thrive in shade or, at best, dappled sunlight. Roberta seems like the type of person who relishes a challenge — a bit of a contrarian, albeit a friendly one. “I don’t love azaleas,” she confesses unapologetically. Her favorite flower, the peony, is notoriously persnickety and difficult to grow in the South. She has five peony plants, but none choose to bloom in time for the Azalea Festival. 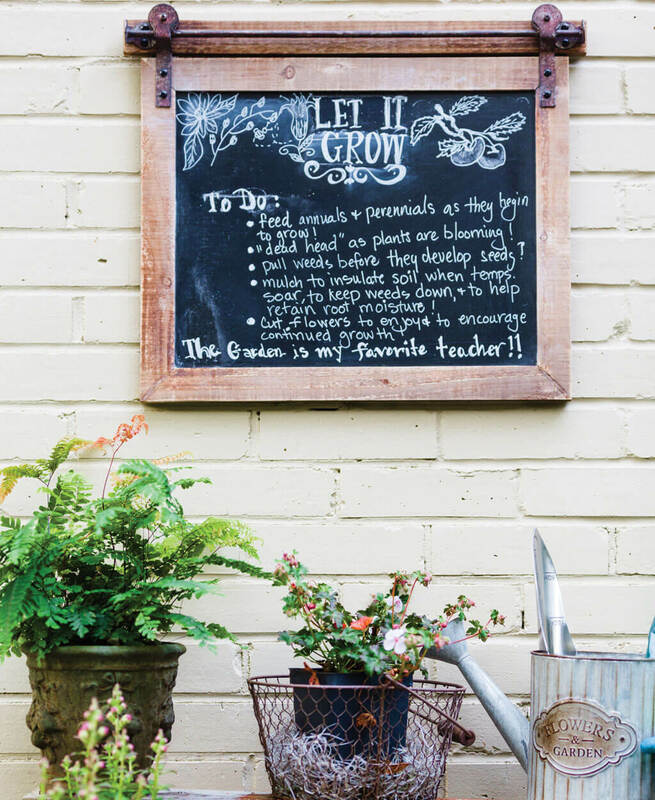 There is a certain humility in gardening, an infinite amount to learn — the perfect avocation for a career educator. As with decorating a house, a garden is never truly done. 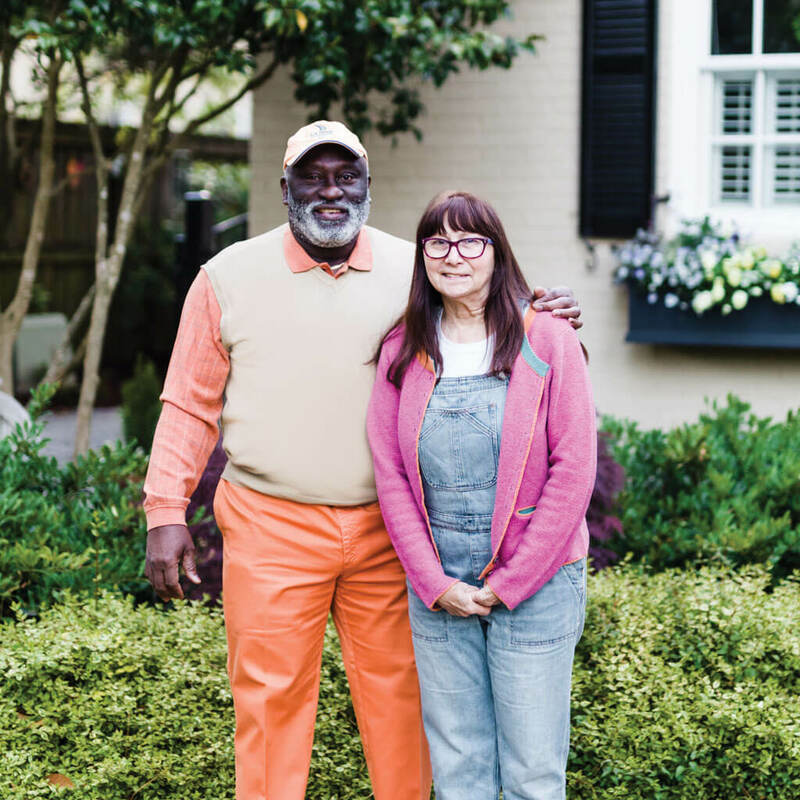 But for Roberta and Tony, the present incarnation of their homes is one worth sharing. Though Roberta acknowledges that allowing a mob of strangers into your backyard is less of an invasion than inviting them inside your house. The home tour is much more “eavesdrop-y,” she says with some glee. He might as well be speaking for the hundreds of Wilmingtonians who put their heart and soul into the Azalea Festival, or speaking for the city itself, transformed for a few days into a celebration not only of the past, but also the present and future, a celebration of all kinds of beauty, perfect and imperfect, enough to go around, enough to include everyone.